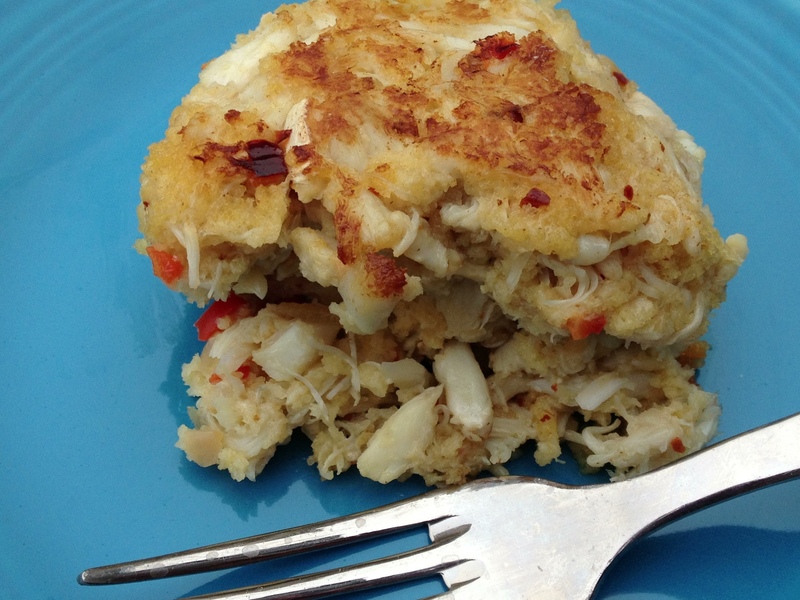 We love crab cakes and are fortunate to have two very good local sources for them. I have tried to make them myself a couple times over the years, but they always seemed to turn out like expensive mistakes. Edible, sure, but I do try to aim higher. Third time’s a charm, as they say. I combined elements of recipes from two old cookbooks (hear that, youngins? cookbooks with real gen-u-ine paper pages, just like Ma Ingalls used to use), and I think I came up with the perfect formula: flavorful but not overly packed with filler. And my personal secret ingredient designed to enhance the delicate sweetness of the crab? One tablespoon of Irish whiskey. Serve these with Bobby Flay’s cole slaw and some potato chips, and you have a delicious meal. In a saute pan, melt 1 tablespoon butter over medium high heat. Saute shallot and pepper about five minutes, until softened and fragrant. Cool and place in small bowl. In same bowl, mix together Worcestershire, Dijon, whiskey, salt, lemon juice and crushed red pepper. In a large bowl, lightly beat two eggs. Add pepper mixture and panko crumbs. Gently fold in crab and combine without over mixing. Using a one-half cup dry measuring cup, scoop up crab mixture and form into a ball. Place on buttered or sprayed baking sheet. You should have 6 to 8 crab cakes, depending on how generously you fill your cup. Melt remaining butter in microwave or stove top. Spoon about one tablespoon of melted butter on top of each crab cake. Bake about 15 minutes. If you prefer a crispier top, they can be placed under the broiler for a minute or two once baked. This entry was posted in Main Dish and tagged baked crab cakes, crab cakes, whiskey crab cakes by Mom Mom's Apron. Bookmark the permalink. Looks luscious, Dawn. We just had them at a local restaurant, which were good. Too hard to find crab in AZ to cook.